OpenSesame is excited to announce the release of Beginning Facebook for Business. As part of our mission to provide individuals and organizations with a broad variety of elearning courses, OpenSesame wants to share our passion for social media with you. We are pleased to offer this complimentary course to assist in your social media development. 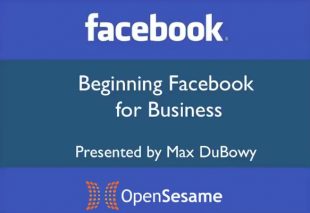 Beginning Facebook for Business is created and presented by OpenSesame’s content and marketing intern, Max DuBowy. This introductory course guides users to incorporate Facebook into their business practice. Learn how to build an audience, generate leads, and expand your business with practical, easy-to-understand tips. Once you view the course, you will have a better understanding of Facebook applications and how to apply them in your marketing strategies. Be sure not to miss out on this free course! This course is great for both professional and personal development. In addition to other courses in the OpenSesame marketplace, training managers can incorporate Beginning Facebook for Business into their learning management systems, and entrepreneurs can view it from their laptops at home. Let us know how the course has helped your business in the course review and comment sections. Also don’t forget to like our Facebook page!